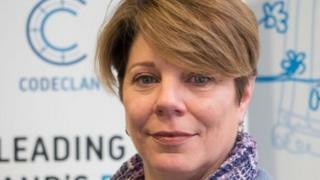 Image caption Melinda Matthews Clarkson said CodeClan had "ambitious plans for growth"
Melinda Matthews Clarkson, who until recently was vice-president of commerce partnerships at IBM, takes over from acting chief executive Adam Bannon. Originally from the US, she has lived in Scotland for the past 10 years. CodeClan is the UK's only accredited academy for software and web development. It opened its doors in Edinburgh in October 2015 and expanded to Glasgow last year. Ms Matthews Clarkson said CodeClan had "ambitious plans for growth". She said: "We'll be expanding our course numbers in 2018, giving more people a career pathway into the thriving digital economy. "We're also looking at delivering our courses beyond the central belt, making access easier for people in other parts of the country. "This will be backed by more partnerships with business. "It will be a win for students, businesses and the sector as a whole." CodeClan chairwoman Polly Purvis welcomed Ms Matthews Clarkson's appointment. She said: "Having someone with a background spanning both sides of the Atlantic will provide us with a unique insight into the way technology and its teaching is evolving. "This will keep our courses current and give our students an education that is unmatched in terms of relevance and value." CodeClan recently announced it had successfully placed a total of 200 skilled people into technology jobs. CodeClan is a not-for-profit social enterprise backed by the Scottish government, digital industry trade body ScotlandIS and Skills Development Scotland.